Sallal Al Dahna (18 54.393N, 42 12.287E) is about seven kilometres before Tanumah if coming from the Abha direction on Route 15. The best way to find the site is to drive towards Tanumah and once you see the town in front of you take the first U-Turn and then drive up the road for a couple of hundred metres and take the first turn just before the first building on the right. This is a tarmac drive and ends after about five hundred metres in a turning area and below this is the waterfall pool. There is another entrance to the waterfall just before the small bridge but this is hardly marked and looks like no road exits, as it is a dirt track. It may also be too rough for normal cars to pass but you can park although allows easier access to the wadi. The best idea is to park here and walk up the wadi and bird your way up to the waterfall. The site is surprisingly compact but has excellent cover mainly of juniper and acacia and as a result a high density of birds. Tanumah lies about 100km north of Abha and is connected by a fast and good road and has numerous bare rocky hills along an escarpment. We visited this site in the morning of 5 July and arrived just after first light. 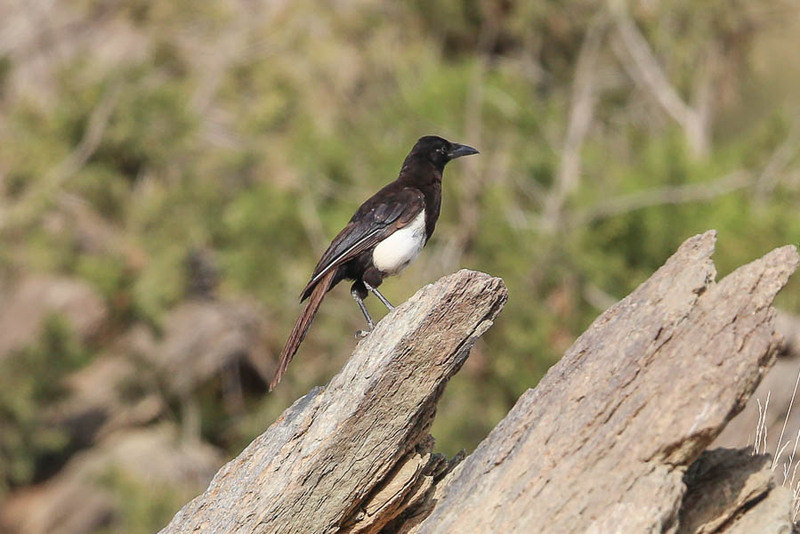 The primary reason for visiting was to try to locate the Asir race of European Magpie which is endemic to this area of Saudi Arabia and may only have 150 pairs left in the wild. 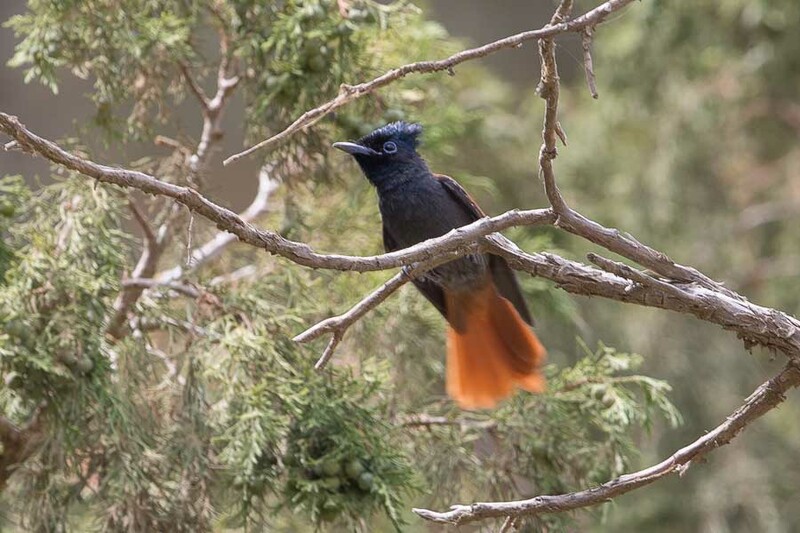 Recent records indicate the species range may be contracting but birds were seen here in May 2002 and again in April & May 2013 when a nest was located at the same site. There was no sign of the magpies when we first arrived but after about thirty minutes we heard odd calling and went to investigate. Here we located two birds sitting in a tall tree that were later joined by a third bird. The birds never really allowed close approach and kept moving around across the valley occasionally giving their distinctive calls. Staying on the tarmac road and looking across the valley would probably ensure success in locating the birds if they were present but getting down in the wadi and looking allows for closer views, although views of the entire valley are restricted by the tall trees. We went down into the wadi after initially looking from the top and ended up getting good views. The cover in the wadi does mean you may need to spend some time here searching as this was one of the best covered areas we bird watched on our trip. There were a good number of birds present in this excellent site including three Eurasian Hoopoes, a pair of African Paradise Flycatchers, 5+ Brown-necked Raven, 5+ Fan-tailed Raven, 5+ White-spectacled Bulbuls, two Brown Woodland Warblers, one Abyssinian White-eye, three Arabian Wheatears, one Little Rock Thrush, two Gambaga Flycatchers, one Palestinian Sunbird and a few House Sparrows. Very nice, indeed a special place and I already visit in May, but I kept to the afternoon to see the magpie ! It is very clear that this bird is geographically separate from the Eurasian Magpie and also a different shape, so I support is noted that (it is full species ). 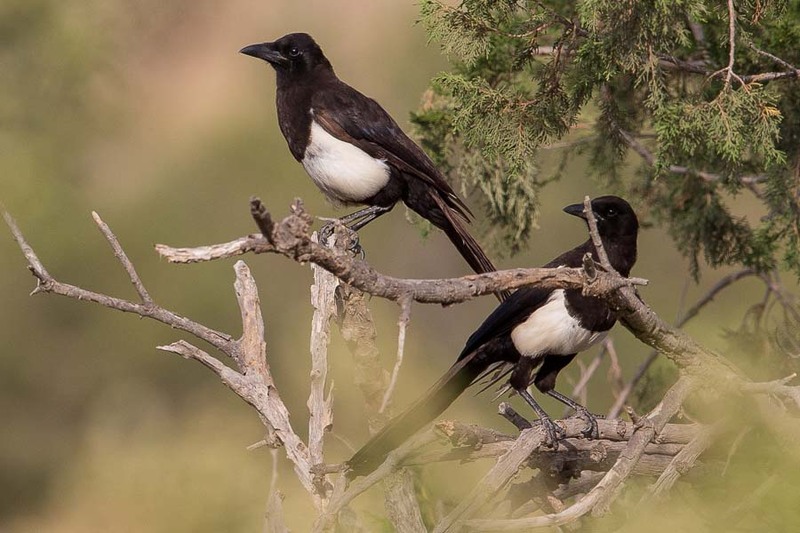 It is a great place and well worth visiting for anyone who birds Saudi Arabia as this sub-species/species of Magpie is on the verge of extinction with very few pairs left according to Jennings 2012.
it´s nice to see another speccies from other places in the world. This post has similar species in ecology and shape due to convergent evolution. 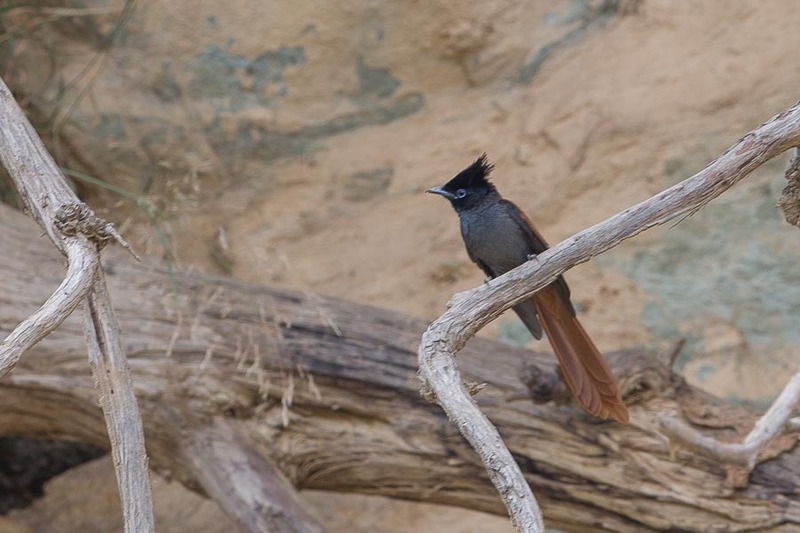 We have flycatchers , Tyrannidae family and hummingbirds resembling a bit to sunbirds. Only magpies have some relatives in my country. Thanks for the kind words on the photos. 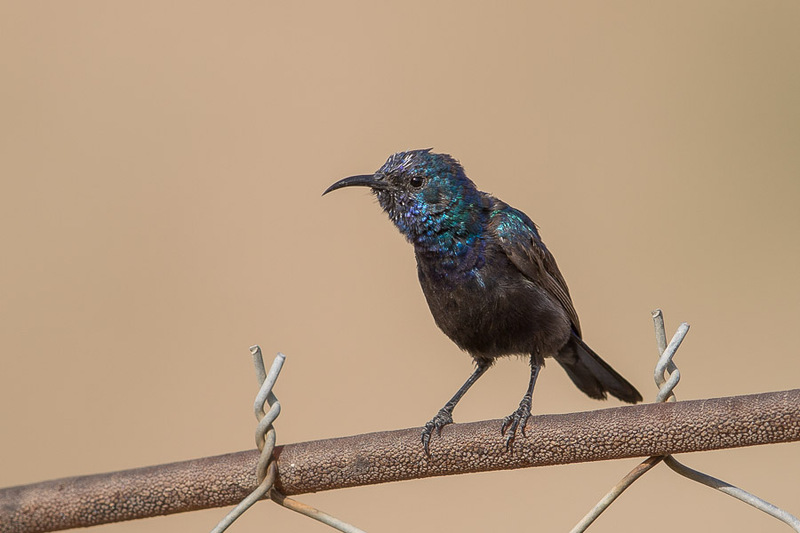 Birding in Saudi Arabia is certainly less colourful than birding in Latin America but birding anywhere is a great passtime and there are certainly are resemblances between birds in different regions as you mention. Great news you have seen the birds in the area. They are certainly very rare and worth looking out for.